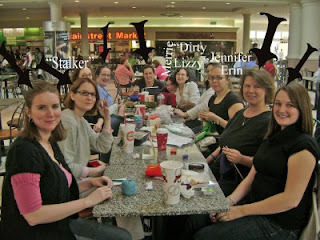 Two Sundays ago, me and a gang of knitters gathered our sticks and string and met up in Crabtree Valley Mall to take over the place. I was fortunate enough to meet some new knitters in the Raleigh area (new folks have black arrows over their heads), along with meeting with some of the ladies I knit with at Caribou Coffee on Thursdays (this cast of characters has been labeled). I didn't add names to the new folks because I was afraid that I'd get them wrong. Please, blame my head and not my heart. I love meeting new folks. 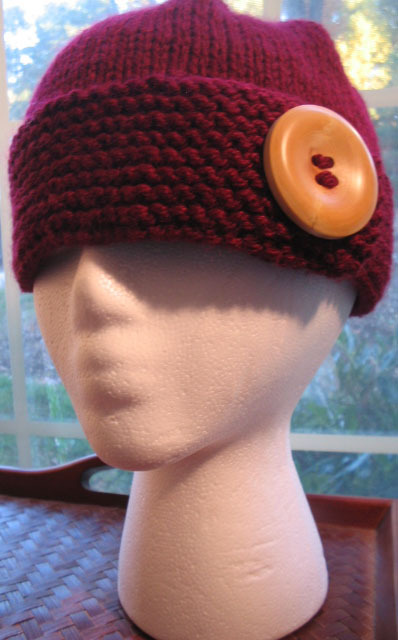 Especially new knitting folks. Everyone was so cheerful and talkative...I like knitters who run their mouths :D They made me feel so welcome that I really can't wait to knit with them again. Seriously, you all rock! And look at how diverse they are. 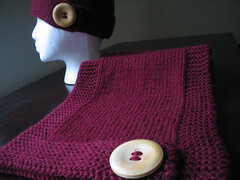 We all meet on the basis of our love for knitting, but we are all into different things. Makes for an interesting group. Sara, what the hell do you REALLY do? I can't remember. Oh yeah, your job is to stalk me (She's good at it too). Doesn't she look all "Stalker-y"? She harasses me during knit night...sits near me JUST so that she can torture me. If I go missing, remember this face.